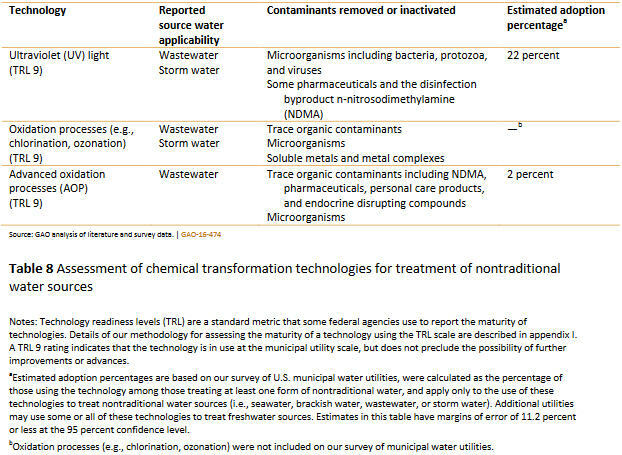 The Government Accountability Office recently assessed technologies that can potentially save the U.S. from water stress, focusing on distribution efficiency and the treatment of nontraditional sources. We provide a snapshot of GAO’s findings, including technology pros and cons, “readiness” rates, and levels of adoption. You might not trust the government — a seemingly popular sentiment these days — but if you were to trust any federal office, it should be the Government Accountability Office (GAO). The GAO comprises 1,800 or so analysts who regularly flame the government for poor performance; in fact, it's kind of their job. Working under the comptroller general of the U.S. (a nonpartisan position with a 15-year term), the GAO performs audits on government programs funded with taxpayer dollars, thus earning the nicknames "Congressional Watchdog" and "Taxpayers' Best Friend". That watchful eye recently focused on the water sector and the worthiness of certain technologies. Published in April 2016, GAO's Municipal freshwater scarcity technology assessment references the Flint water crisis and ongoing Western drought in its prologue — "Why GAO did this study" — explaining that threats to water security have a likelihood of worsening and the potential to cause conflict. 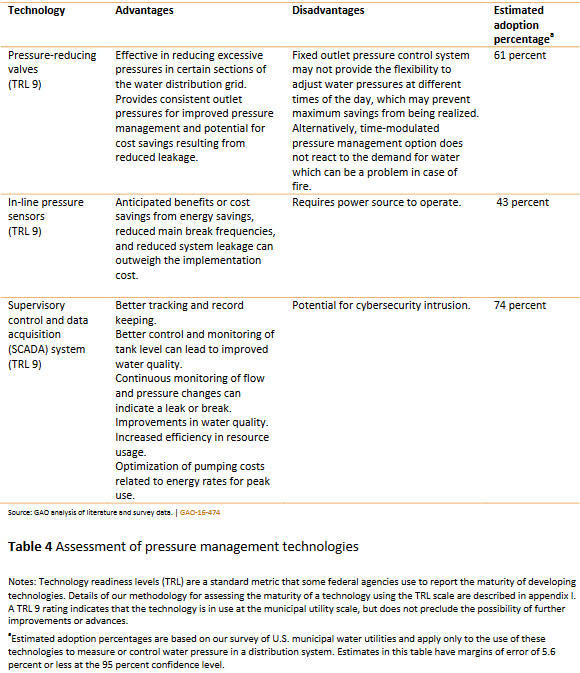 This can be mitigated or eliminated by saving the water we have and by developing new sources, bringing us to the mission (and subtitle) of the report: "Using technology to improve distribution system efficiency and tap nontraditional water sources". 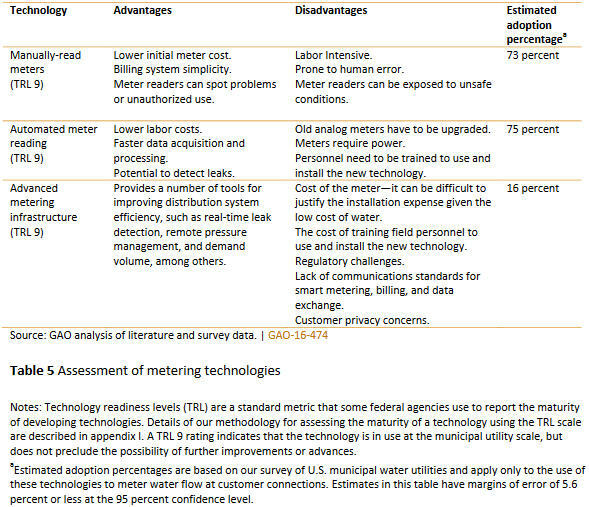 GAO analyzed scientific literature, conducted interviews, visited sites, and surveyed utilities to arrive at conclusions on technologies divided into two segments. 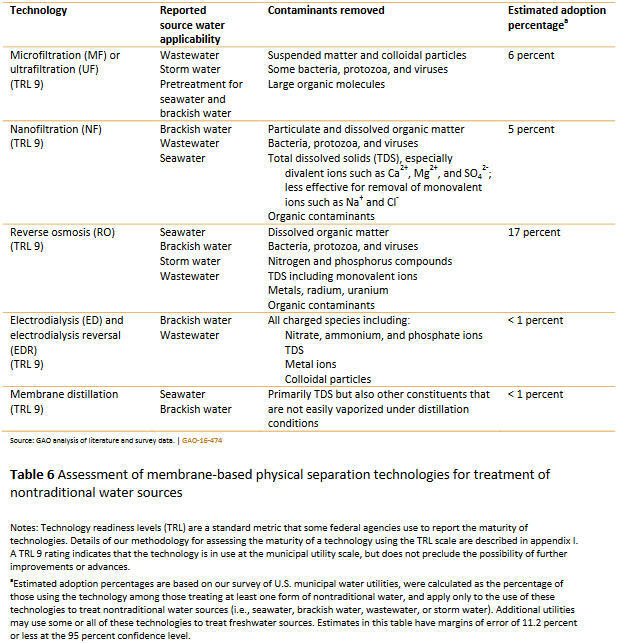 technologies that could increase water supplies by using nontraditional water sources. 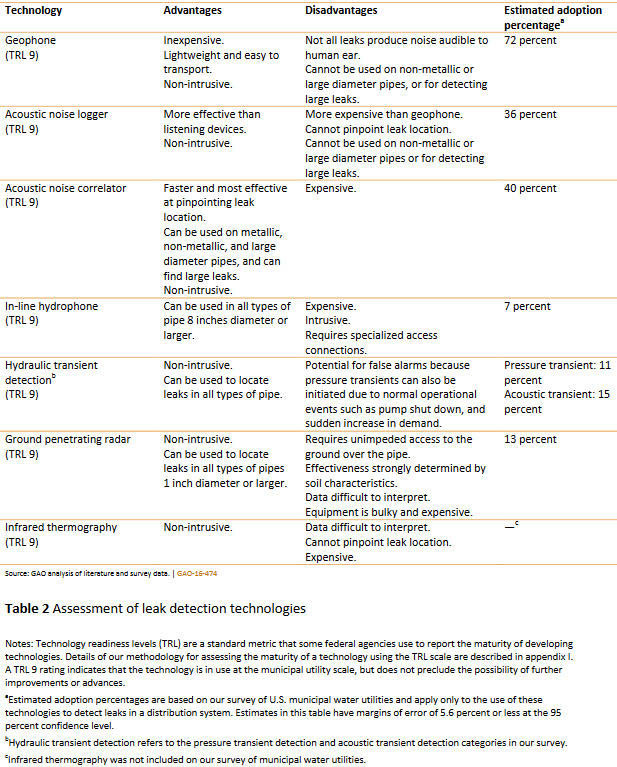 The efficiency-related assessments, which considered technologies that perform leak detection, pipe condition assessment, pressure management, and metering, listed the advantages and disadvantages encountered with each. 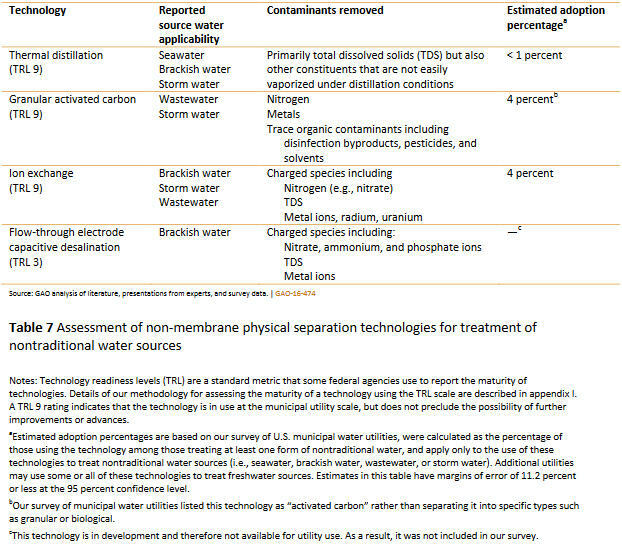 When it comes to acquiring “new” water through treatment, the assessments focused on the source — e.g., wastewater, seawater, brackish water — and the contaminants removed. 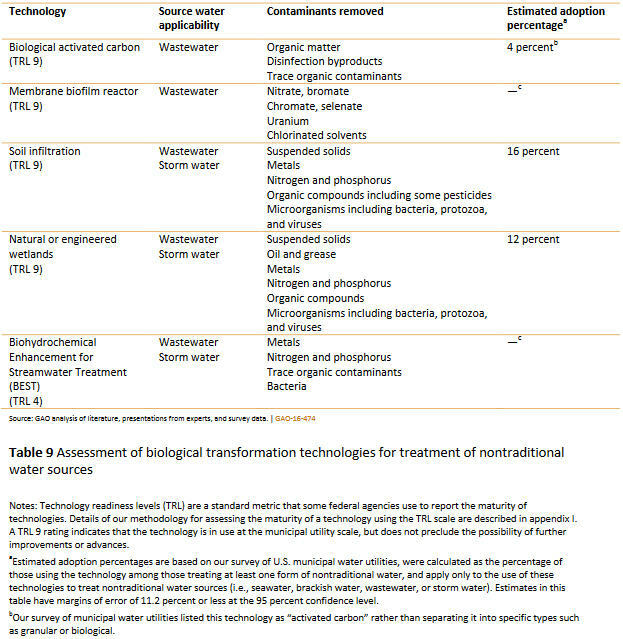 The types of treatment technologies analyzed were categorized by methodology: physical separation (membrane-based and non-membrane-based), chemical transformation, and biological transformation. 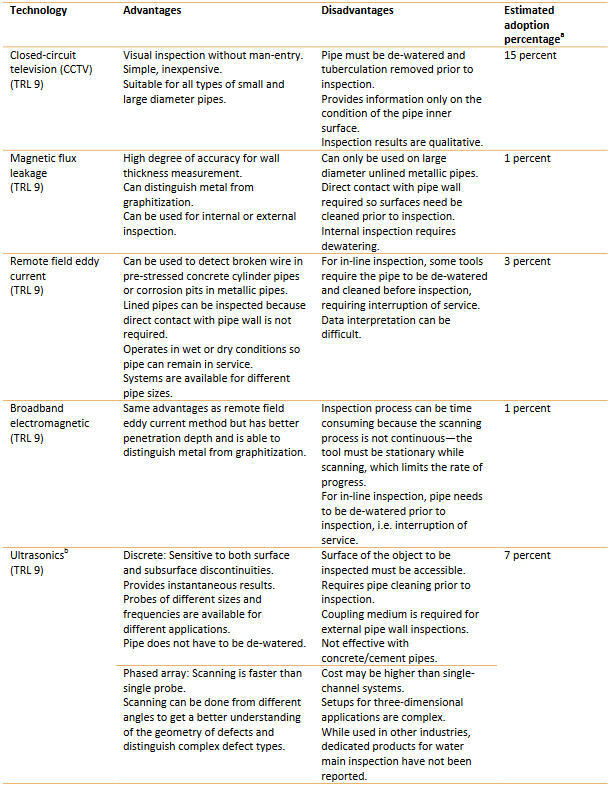 GAO neatly summarized their findings in the tables copied below, starting with the assessment of distribution technologies aimed at efficiency (or skip to treatment technologies for nontraditional sources). 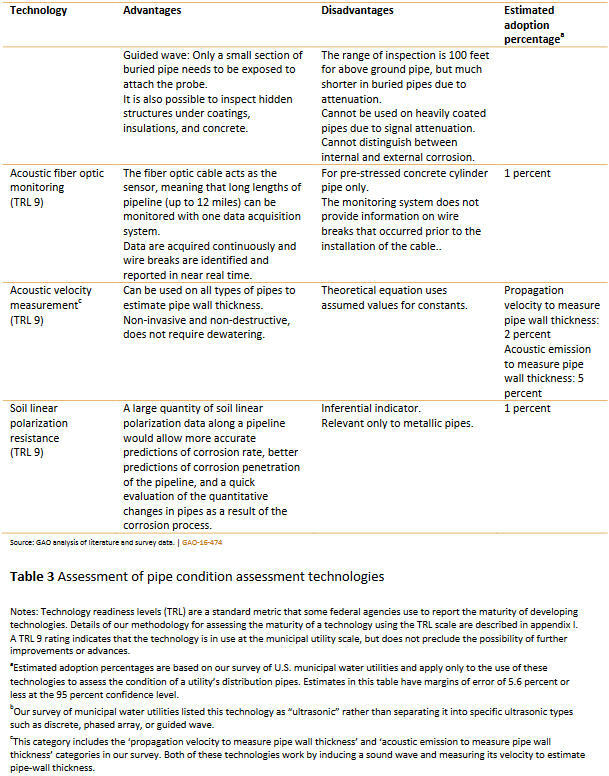 For more analysis and information, including an overview of locations and types of water utilities where these technologies are most common and useful, download the full GAO report.